Align your teeth with Invisalign®! This breakthrough orthodontic dental technology has changed lives all over the globe and Dr. Sona Asatryan, Invisalign dentist in Pasadena, proudly provides this amazing new technology for our patients interested in straightening their teeth for a beautiful smile. Simply fill out the form below to claim your FREE, no obligation Dental Implant Consultation. 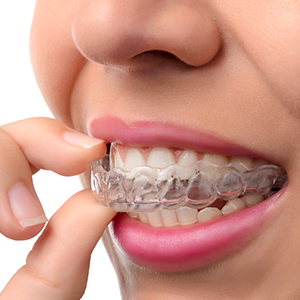 Virtually Invisible – Invisalign aligners are transparent, so no one can even tell you’re straightening your teeth. The perfect choice for adults who may be concerned with the embarrassment or shame often associated with metal braces. No Diet Restrictions – because Invisalign aligners are removable, you can eat all your favorite foods as usual without being restricted. Shorter Duration – Invisalign treatment, on average, does not last as long as traditional metal braces. For most adults, Invisalign will last 12 months, or 1 year. Metal braces are often worn for up to 2 years before they are removed. Convenient & Hassle Free - oral hygiene maintenance does not change. You can brush and floss any time you want! The process is simple & straightforward. Invisalign invisible aligners are worn for a period of two or three weeks and then replaced with a new set of aligners. Each aligner is a straighter and more aligned version of your teeth. The aligners gently and gradually push your teeth into their desired positions until treatment is complete. Dr. Sona Asatryan will be with you every step of the way. Most adults average a treatment time of about 12 months, which is shorter on average than those who wear metal braces for up to 2 years before they are removed. Dr. Sona Asatryan has been straightening her patient’s teeth using Invisalign in Pasadena for many years, ensuring their treatment is comfortable throughout the entire journey. If you are interested in Invisalign treatment and would like to know information such as the cost of Invisalign, insurance information, or have any other questions then please call our office @ 626.431.2654 or conveniently contact us online below and we will respond as early as possible.